Now available on Kindle and classic book format. Twins Ted and Fred Knight carry on the family business – ghost-hunting – with enthusiasm and pride. They've assembled a team of unique ghost-hunters and even started their own show, Ghostly Mostly, to chase their obsession. One thing threatens everything the Knight twins have built: Damian Rook, host of their own show. Damian is brilliant, dark, and scares more viewers of Ghostly Mostly than the ghosts. 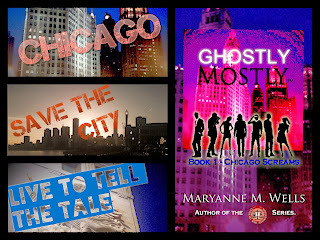 The Knights need a new host, but they don't want to anger Damian, especially during a ghost hunt in Chicago. Damian's made his own plans for Ghostly Mostly. He's decided who the new host will be, and no one – not the Knight twins or even Damian's new recruit, Kat Pojim – will get in his way. 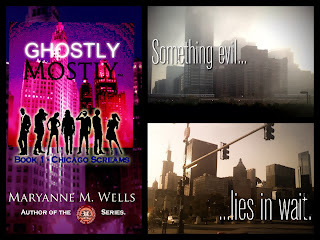 But there's one thing no member of Ghostly Mostly can control – the supernatural. Once the team is locked inside Chicago's haunted Castle, an evil spirit takes control. If the members of team Ghostly Mostly are going to survive, they'll have to work together. If the Castle has its way, no one – ghost or human – will make it out alive.